"Open Channel 'D'".............Man from U.N.C.L.E. communications command. Potter may have uttered Great Caeser's Ghost, but it was Editor Perry (don't call me Chief) White in the old Superman series that made the phrase famous. When the narrator in The Fugitive, The FBI, The Invaders, Cannon, Dan August, Banyon, Streets of San Francisco and Barnaby Jones: "A Quinn Martin Production....Tonight's Episode:...". Satirized on Police Squad! (the voiceover never matched the title card). "Please don't squeeze the Charmin"
"Mom always liked you best!" 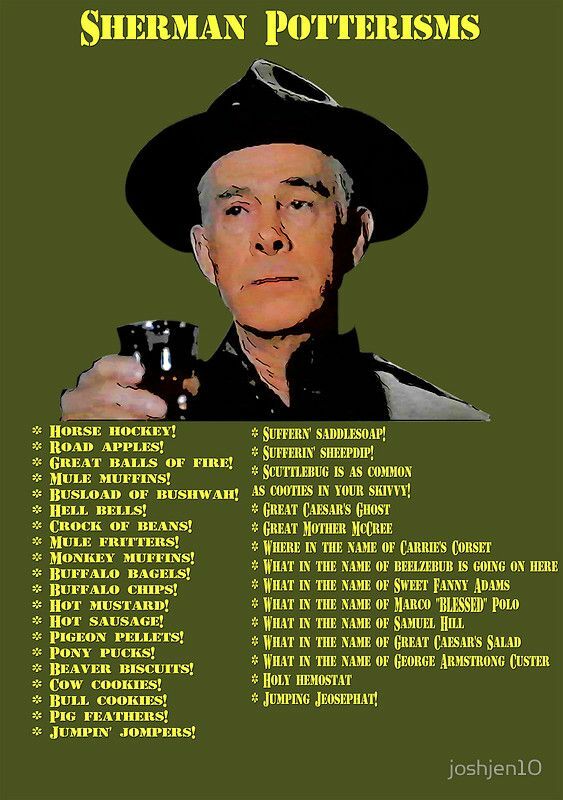 "No brag just fact" from the Guns of Will Sonnett which ran from 1967-69 & starred Walter Brennan. He also starred in The Real Mc Coys 1957-63. I can't recall a character quote from TRMC. Give me a call when you got no class. Fun fact: The star of Cannon, William Conrad, was the narrator for Rocky and Bullwinkle. It's "Cheezborger, cheezborger, cheezborger, Pepsi, no Coke no Coke, Pepsi!" Except for the end of one skit, when a Coke salesman (played by Walter Matthau) convinces John Belushi to switch. Belushi agrees, so the last line of the skit is "No Pepsi. Coke." Shazam! Shazam! Shazam! Also: Well GOOOLLLLLLLLY." B: "Hey Rocky -- watch me pull a rabbit out of my hat!" R: "Again? That trick never works!" B: "This time for sure!" Actually, Bullwinkle had a different response for every animal that came out of the hat. For the bear "Wrong hat" (no oops), for the rhino "Ooh, I don't know my own strength", for the tiger "I take a seven and a half", for the lion "I gotta get another hat", and lastly (when he pulls Rocky out of the hat), "Well, I'm getting close." Rocky's response to this was usually "And now, here's something you'll really like", except when he was pulled out of the hat, when he would say "And now it's time for another special feature." Also, there were two versions of the "bear from the hat" routine. One had a red background and ended with Rocky saying "And now it's time to meet Mr. Peabody. ", the other was the standard blue background with Rocky making the standard response at the end. As for other R&B recurring quotes: "It's not the Canadian way" was always uttered at some point during a Dudley DoRight episode. "I forget how to make a 'B'" or "But how do you make the 'B'" was another one uttered at some point during some Adventures segment. And let's not forget the "Now there's something you don't see everyday Chauncy. What's that Edgar?" dialogue that would show up at random and unexpected times during the show. - I'll make mincemeat out of that mouse! - Klondike Kat always gets his mouse. - And sometimes, he gets his Major. - Tennessee Tuxedo will not fail. Sergeant Oakey Homa: Begging the Colonel's pardon. Col. Kit Coyote (following Ruffled Feathers' gibberish): What did he say?